Autumn has me thinking of flaky pie crusts and warm hearty meals that fill the soul. It also has me thinking of game meats and how much I love them when they are cooked just right. 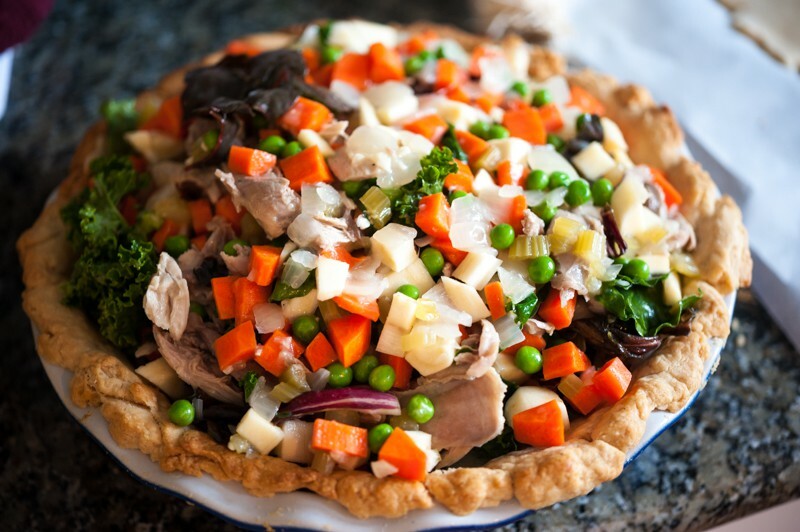 A pie is perfect for a medley of game bird scraps that wouldn’t necessarily make a meal on their own. After all, when you have worked so hard getting your meat you don’t want to waste any of it. 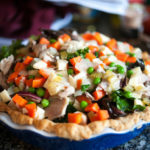 This game bird pie recipe uses a double piecrust, the way you would in a traditional potpie, but you could also use leftover mashed potatoes as your top “crust.” This is sometimes referred to as Hunter’s Pie. A version of this was sent to me a long time ago by one of my blog readers, who said his mother in McLeansville, North Carolina, often made it with pheasants, but any game bird or even other game meat will work well. I like to use vegetables that are cut to similar sizes so that they cook evenly and each bite is full of a variety of flavors. It also looks beautiful when you cut into it. Use what you have and what is in season — parsnips and carrots add a wonderful sweetness. So do peas. And then there are winter greens which will add bitterness. 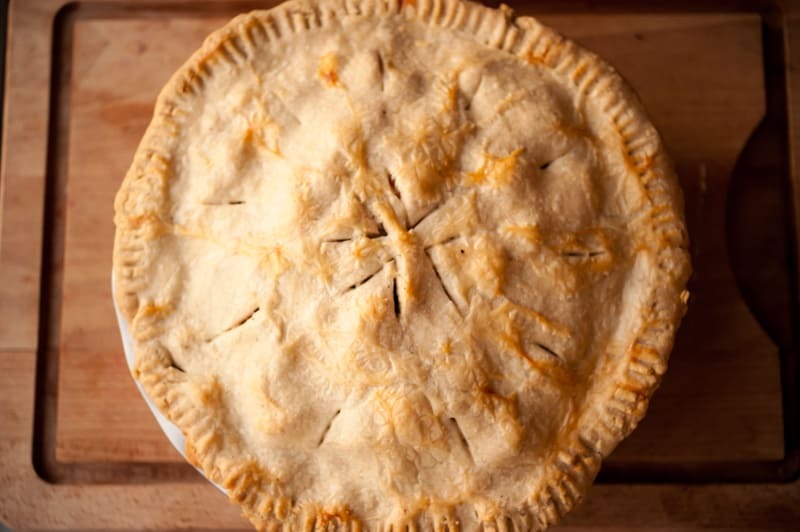 Now you could put mashed potatoes on the top of this beautiful medley… but I prefer a piping pie with a flaky crust. I use Leaf Lard in my crusts, which makes it incredibly flakey. In fact, I can’t imagine making a pie without it. 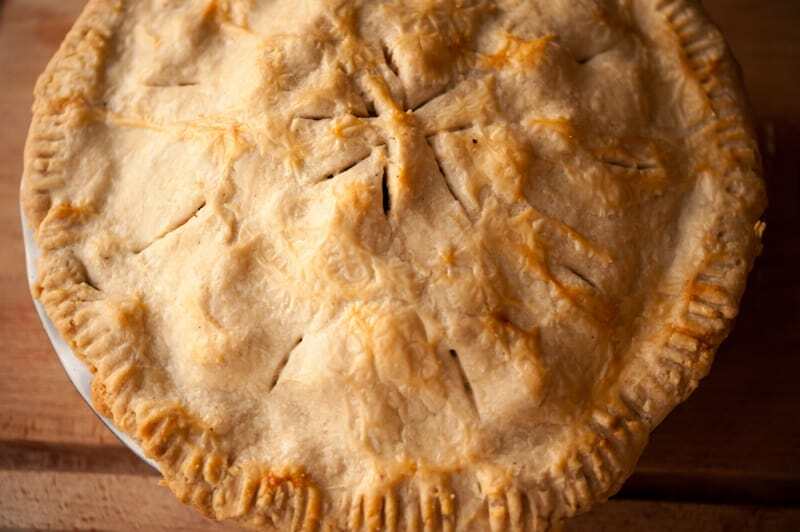 You can order a lot of it and keep it in your freezer or refrigerator to have ready when you’re in a pie-making mood. You combine the lard with grass fed butter, Kerry Gold is a brand that is easy to find. These details seem small but they are really what makes your crust next level. 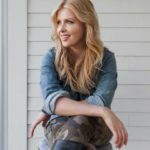 Interested in trying ALL of my Wild Game Recipes? Click here! Combine the flour, lard, butter, nutmeg, and salt in a bowl and work it with your hands until sandy and lumpy. The lumps of fat should range from pea to walnut size, which will ensure a flaky crust. Add a few drops of water at a time until the dough comes together but is not too sticky. The amount of water you need will vary, based on humidity. If it is very hot, work quickly. Divide the dough into two disks. Wrap them in plastic and place them in the freezer for about 30 minutes. Remove the dough disks from the freezer, let rest for 10 minutes, then roll out the first one on a cutting board, dusted with lots of flour, until the circle is slightly larger than the size of a 9-inch pie dish. Drape it over your pie dish. Trim as needed, and patch if need be, using a bit of water and extra dough scraps. Put the pie dish back into the freezer for at least 30 minutes, preferably longer. Once the bottom crust is frozen in the pie dish, preheat the oven to 425°F. Bake the crust for 20 to 25 minutes, until it is firm and golden brown. If the dough puffs up at all, simply pat it down with the back of a spoon. You won’t need pie weights here because you have frozen the crust. Remove from the oven and let cool. Combine the chukar, stock, onion, garlic, celery, wine, and salt and pepper in a pot. Bring to a simmer and cook, partially covered, until the meat is loose, about 1 hour. 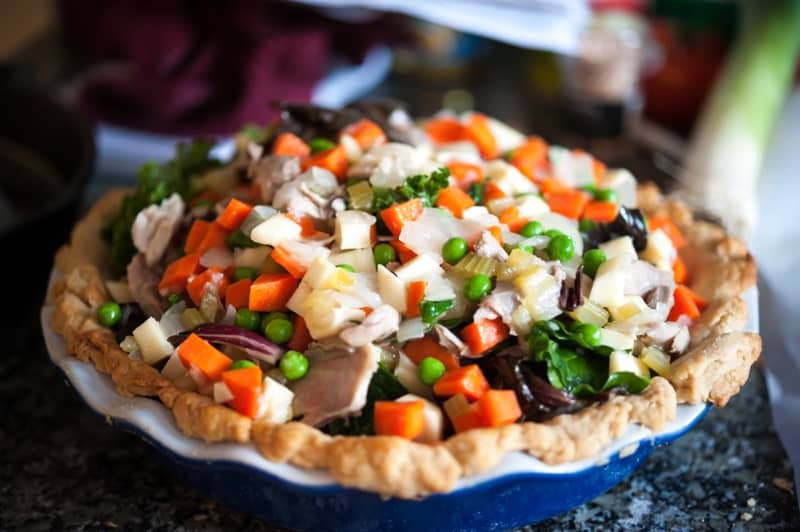 Allow the filling to cool slightly and then remove the meat with a slotted spoon, pull it from the bones, and cut it into bite-size pieces. Set it aside on a plate. Preheat the oven to 350°F. Meanwhile, in a small saucepan, melt the butter and whisk in the flour until it bubbles, 1 minute. Add the milk and whisk until a paste forms, then add the paste to the pot containing the broth and bring to a boil. Stir until the broth has consistency of gravy, , about 10 minutes, then re- move from the heat. Add the meat and additional vegetables to the broth, along with thyme. Season with salt and pepper to taste. Add the filling to the prebaked crust. Roll out the second dough disk on a floured surface, until it is about an inch wider than the pie dish. Drape it over the filling. Trim the edges and tuck them under the top crust. With a pastry brush, brush some beaten egg white along the circumference, between the two crusts, and press down gently with your thumb or a fork. in the center and on the outer edges. Bake at 350°F for 35 minutes, until the crust is golden brown. Serve hot. Also try: brant, coot, duck, gallinule, goose, grouse, prairie chicken, partridge, pheasant, pigeon, ptarmigan, quail, rail, snipe, turkey, squirrel, rabbit or a combination of those leftover scraps.